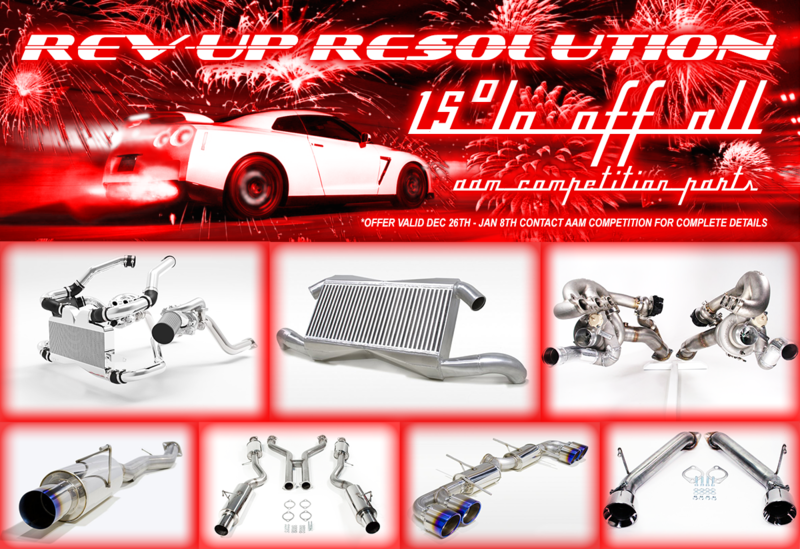 AAM Competition Rev-Up Resolution end of year sale! 2016 is upon us! From now through January 8th, AAM Competition is celebrating by offering 15% off MSRP on all AAM Competition products! Don't get stuck using your outdated setup from last year's build. Leave 2015 in the dust, and rev-up your resolution by putting the pedal to the metal with new performance parts! Throw it in-gear and speed into the New Year! Consumer offer only: Cannot be combined with other offers, promotions, coupons or discounts including dealer pricing. Product discounts apply to new AAM Competition brand products only (Excludes Package Offers). AAM Competition reserves the right to discontinue or modify this promotion at any time without advance notice. Other restrictions may apply. Payment options available, Contact AAM Competition for complete details. Its almost the new year! Start it off with fresh parts for your ride! Last week to save 15% on all AAM Competition products!!! Last day to save 15% on all AAM Competition products!!! AAM Competition R&D opportunity for AWD G Platforms!!! Quick Reply: AAM Competition Rev-Up Resolution end of year sale!